Website e-commerce – yes, you are offline but sometimes people can’t but from you offline or want to come later to check you out. Please make sue your website is ready for readers to buy when you are around. Your website should have a store available for all types of readers no matter what type of device they own. Printed books – being offline means having product. Make sure you choose quality printing at affordable prices. Can’t buy in bulk, use print on demand options from companies such as Createspace.com and IngramSpark.com. Tip: Always have ten copies of your books on hand at all times. Never pay more than $4 a book. Credit card processing – being offline also means handling customers who don’t carry their money around. SquareUp! Be able to take credit cards with ease, invoice out, keep up with inventory and create a store for offline customers to visit right from your phone or their phone. Paypal.com also offers portable credit card options as well. Marketing Materials are a vital part of being offline. When offline customers can’t immediately buy books from you, your Marketing materials can be the Key too encouraged them to go online to buy your book when you are not around. Make sure your website and social media are on your printed materials. Example marketing materials are business cards, banners, pens, flashdrives and more mentioned below. 1. Events (not booksignings) – gone are the days of just sitting in front of a crowd of people and reading your works. Now authors have to have events to get people in the door. Go to your out of the box ideas and create an event that will to come. Contact libraries, independent bookstores, businesses or schools (niche related) and organizations ( monthly meetings) to offer a chance to speak on a certain topic. Scared to speak in front of a crowd, check out your local Toastmaster chapter. Make sure you are doing events geared for readers and writers. 2. Create a Press Release – Sometimes you can sell a book offline without even being there. Getting your “news” in the hands of media such as radio, television and print is an awesome way for authors to “get the word out” or sell a book without having to be present offline. Don’t forget to submit to local talk shows on local cable stations and podcast shows. 3. Distribute flyers – using resources like canva.com or fiverr.com, authors have the power to create awesome flyers/postcards without breaking the bank. See marketing material above on other places to get promotional material to pass out. Make a goal in passing out your material. Take twenty flyers/postcards everyday and share out. Didn’t finish passing them out by the end of the day, then you have to work extra hard the next day until they are all gone. Don’t forget contact info, social media links and websites on your flyers, or it’ll all be in vain. (Trust me this has been forgotten before). NO 8.5×11.5 flyers, please. They are too big and too bulky to be going around with them. Do half that size on quality stock paper with color. You can also pass out free brochures and booklets (6 to 12 pages) as well. Buy cardstock from office supply stores and print your own on your printer. 4. Volunteer with local organizations that relates to your niche. You would be amazed at the strong connections and support to your literary endeavors that you can make when you volunteer somewhere and they know you have books. You can send press releases and articles to these to include in their monthly zine to their members. Sell books at the monthly meetings at the back of the room. Take business/book cards with you everywhere. To find niche related Associations and Organizations, go to your local library and get the resource called Encyclopedia of Associations, because it’s really expensive to buy your own copy. True, I said don’t have a book signing where you just read your work, but working with other authors, organizations and businesses where literary pavilions draw readers carrying cash work wonders in terms of networking, selling product and meeting other authors. Now I’m not going to guarantee you’ll sell loads of books, but the networking has always been wonderful and led to more book selling opportunities. 6. BONUS & OUT OF THE BOX: Sell Ebooks offline. Now I know this may sound very wacky, but it works. Taking a QR code and post it on a business card, with your book cover on the front. The QR code can lead to an actual book where the customer enters a discount code and bamm! They have the book. You could easily sell these cards for $1.00 to $3.00 with no expense to you. Check out qrstuff.com to get the QR code and then load your book at Smashwords.com to get discount codes. Extras: You can use flashdrives and CD-roms as well. Collaborations with other authors – most of the suggestions above can be worked on with other authors to save on cost, headache and time. Find other authors in your community, network and see about partnerships you can do. Even sharing a table at a book festival can do wonders for your pocketbooks and your shyness. 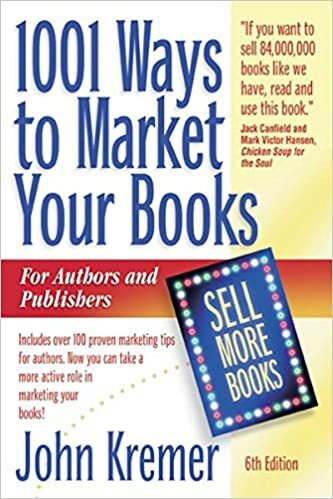 Still running out of ideas to market your book offline and online, well check out John Kremer’s 1001 Ways to Market Your Book. By @SylviaHubbard1 in authors, Uncategorized on April 14, 2016 .